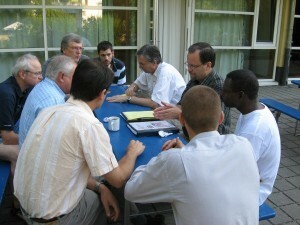 Leaders of Grace Brethren fellowships from around the world met in 2008 in Germany to develop the Commitment to Common Mission document which is now guiding efforts of Grace Brethren worldwide to cooperate for the next decade in the areas of evangelism and church planting, leadership development, and integrated/holistic ministries. The meeting was coordinated by Dave Guiles of Grace Brethren International Missions, and included participants reporting in from Africa, Germany, Argentina, Pennsylvania, Tennessee, and Indiana. Francois Ngoumape, reporting from the Central African Republic, noted that a number of churches there have begun specific implementation of the Commitment to Common Mission document that was developed by the Charis group in 2008, and also indicated that a followup steering committee document will be considered at an upcoming meeting of the national fellowship in the C.A.R. in January. Jorge Nunez, reporting from Argentina, detailed a meeting two weeks ago in which he and other Charis leaders spent several hours reviewing the strategies, and then devoted two half-days to forming small working groups specifically charged with implementing parts of the Charis strategy. He also reported excellent movement on the part of some churches in Brazil, and Nunez noted a developing strategy whereby successful business owners can “adopt” a fledgling business, working as coaches or encouragers for those who may be developing business-as-mission in the early stages. Keith Shearer, the North American representative, reported on the recent meeting of the Enduring Visionary Leadership Council at which each of the three components of the strategy was discussed, and he noted that a leadership meeting the first week of December will continue the discussion and emphasis on the commitment to common identity. Rainer Ehmann, reporting from Germany, indicated that the German ministerium met earlier this month to officially adopt the CCM document, and he also noted plans for an all-day meeting in February to work on further implementation. Discussions have also been held with Tom Barlow and Paul Klawitter about implementation in other parts of Europe and the UK. Wayne Hannah, reporting from Tennessee on behalf of the Asian Grace Brethren churches, noted in particular some recent developments in the Philippines where Christian Beuggert has translated the CCM document into Tagalog for churches there. Specific progress is being made in the integrated ministries segment of the strategy in Asia. Terry White of the Brethren Missionary Herald Co. commented on worldwide communication facilitation. Documents from the September meeting in France have now been translated into French and Spanish translations are expected soon, and these will then be posted for worldwide distribution. He further detailed Charis information-sharing through FGBC World publication and website, and through the BMH Editor’s blog. The leadership group committed to meeting approximately every three months, to working on more intentional sharing of specific information and strategies between cultures, and to the update and continual flow of information.